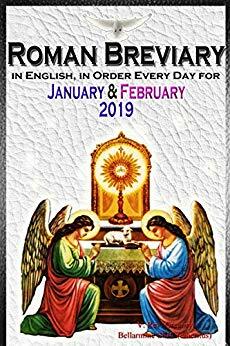 Pray the Pre Vatican II, Traditional Roman Catholic Breviary to sanctify the new year and prepare for Eastertide, in English totally in order! No back and forth flipping, no excessive clicking, no complex calculating what Day it is or which propers, or antiphons - just click the Date and pray the Liturgy of the Hours. Super easy. The most important Catholic Prayers collection and the duty of every priest to pray daily, the Divine Office or Liturgy of the Hours is the foundation of the spiritual life and at the heart of all spiritual warfare. Look for the March-April 2019 Catholic Breviary in the first week of February and please help spread the news about the traditional Divine Office!